Description is accurate. Price was good. SLIM AND LIGHTWEIGHT: The lightweight design of this pillow makes it perfect for travel, or to use just about anywhere. Great for use in bed, on the couch, or even on the floor. You wake up sore every single day. Your neck hurts, your back hurts, even your legs and knees hurt. No matter how you lay, or how many pillows you use, you just can't seem to get comfortable or find any relief. The 4-in-1 memory Foam Pillow from Deluxe Comfort is the answer you've been hoping for! This one amazing pillow eliminates the need for four kinds of pillows: lumbar pillow, neck support pillow, wedge pillow, and knee pillow. By alternating where you place the pillow, you alternate among the many therapeutic benefits this pillow has to offer. When used under your head and neck, it creates spinal alignment and prevents neck strain. Give your lower back a little extra support when sitting by placing the pillow behind you on a chair or in bed. Place it between your knees for spinal alignment and to prevent your knees from rubbing together in the night, causing soreness. You can also use this four-in-one pillow to elevate your feet and legs. 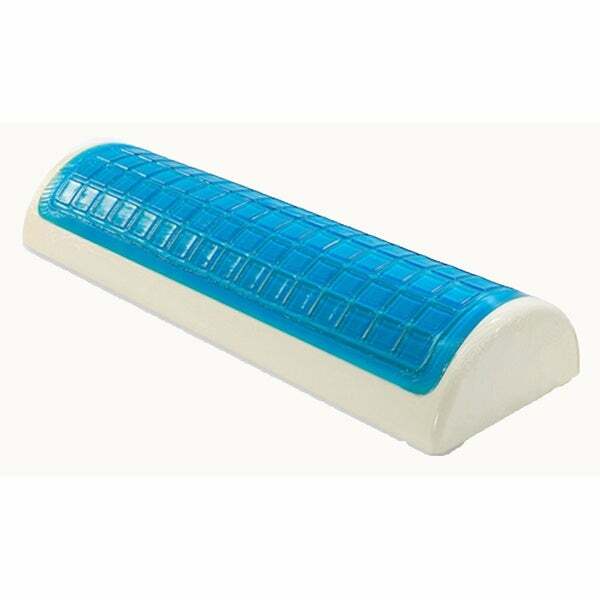 This will help prevent those painful leg cramps that wake you in the night, and will relieve some of the tension in your lower back, both preventing and relieving lower back pain. Being both hypoallergenic, and being comprised of a breathable material, this unique four-in-one pillow is a comfortable and wonderful addition to any bed the whole year through. Get your AMAZING 4-in-1 PILLOW before we sell out! Perfect support to prevent aches and pains caused from "sleeping wrong." The first night I used this, I didn't move or wake up once. I have a large collection of similar pillows that have been "okay" or "good enough," but this one is pretty close to perfection. The unique design had me a bit concerned, but being I’ve tried far too many conventional style pillows, I opted to give this a try. My head gets very warm and to this point this design seems to being well for me. It is wide enough to give good support what is a large head. The gel pads that are molded into the pillow are supposed to provide extra cooling. I don’t know if it’s amount of contact my head has with the pillow due to its shape or the gel, but this pillow sleeps cooler for me. The height is just right for me. As a side note, if you tend to sleep warm and sweat, use natural fibers. Microfiber and polyester just don’t breath as well. Wow! Absolutely LOVE this Half Moon Memory Foam pillow with Cooling Gel. This pillow is exactly what I have been searching for and I highly recommend Overstock.com and especially this pillow. This half moon pillow was a bit pricey but you get what you pay for and I am completely satisfied! Overstock.com wins again! I love this pillow! It has really helped my neck issues. I use it in conjunction with my horseshoe-shaped pillow. Love the comfort of this pillow while sleeping. And the Cooling gel is perfect, where the pillow isn't too hot or cold. Love this knee pillow - very cooling! This is the neck pillow my husband has been looking for. It is high enough to support his neck when laying in his back. Love the cool gel!! We are having a seamstress make a few custom pillow cases for it. I think a good pillow is the key to a good nights sleep. This pillow is just the right height to support your head and neck, and it is perfect density. It is worth the price - good quality for good sleep! This pillow is like on I had for at least 15 years except it has the gel enhanced coating. It is just too cool for me. My last pillow I loved so much. I have a bad neck and shoulders and it help me so much. If you can tolerate the gel being so cool then I highly recommend . Found this for my husband, and he loves it. Just right for him. It is firm enough, and small enough for him to sleep with it under his knees. Also, the cooling gel really works! "What is the thickness and length of this pillow?" I am looking for a longer half round cervical sleep pillow and the description sounds like it will fit the bill, plus it has positive reviews both here and on Amazon. I chose this based on the price and reviews.